As the weekend gets closer, you can stay updated on where fishing is the best by reading the Division of Wildlife Resources' weekly fishing report. The report is available at www.wildlife.utah.gov/hotspots. You can also receive the free reports via email by subscribing to them at www.wildlife.utah.gov/e-lists/subscribe.php. In northern Utah, Willard Bay Reservoir and the larger reservoirs in the region that have trout in them might be the best spots to fish over the weekend. Regional Aquatic Manager Craig Schaugaard says Willard Bay should provide good fishing for wipers and catfish. And the main trout fishing reservoirs in northern Utah, such as East Canyon, Echo and Rockport, should provide good fishing for trout. Schaugaard says the water in most of region's trout-fishing reservoirs has usually warmed up by the July 4 weekend. As a result, the trout fishing slows down. "But I think fishing at these waters should still be good during the July 4 weekend this year," he says. Lakes in the Uinta Mountains are also usually a good bet for anglers on the July 4 weekend. Schaugaard says lower elevation Uinta lakes should offer good fishing. But he's concerned that some of the trout in Uinta lakes that are at higher elevations may have died during the winter because the lakes have been covered with ice for so long. "I don't know if the Mirror Lake Highway (state Route 150) will be open," he says. "But if it as, and if we can stock [the lakes along the highway], fishing there could be good." Because conditions are a little "off" in northern Utah this year, Conservation Outreach Manager Phil Douglass recommends reading the DWR's weekly fishing reports. The reports will keep you updated about fishing conditions and where fishing is best. You can receive the free reports via email by subscribing to them at www.wildlife.utah.gov/e-lists/subscribe.php. You can also read the reports at www.wildlife.utah.gov/hotspots. Douglass says the age of mobile phones is allowing anglers to "receive the updated reports directly through email, wherever they are." Whether you receive the updates via email or read them on the DWR's website, Douglass says the reports are "a great way to prepare for the Fourth of July weekend or any other day of fishing." Conservation Outreach Manager Scott Root says two waters in north-central Utah should provide "hot" fishing during the July 4 weekend. Anglers who have fished at Utah Lake recently say the lake is one of the best places in Utah to catch fish right now -- a lot of fish! For example, Cliff and John Bowden of Salt Lake City recently reported catching and releasing more than 30 channel catfish from the shoreline at the lake west of Provo. Many of these catfish weighed more than five pounds. DWR employees Chris Crockett and John Fairchild recently spent a Saturday kayaking at the lake with their fishing equipment. Both of them caught limits of catfish. Channel catfish can grow to a large size; some of the catfish anglers have caught at Utah Lake in the past have weighed more than 30 pounds. Root says the most popular way to catch catfish at Utah Lake is simple -- cast a nightcrawler, white bass meat, carp meat, yellow perch meat, shrimp or other "stink" baits, and let them rest on the bottom of the lake. "You can catch catfish almost anywhere on the lake," Root says, "but casting your bait in the open water near stands of vegetation, such as cattails, is an especially good place to try." White bass are another species that can provide fast action at the lake. And there's no limit on the number of white bass you can have in your possession. "Imagine catching your limit of eight large channel catfish," Root says. "That could be as much as 30 to 40 pounds of fish. On top of that, you can keep an unlimited number of white bass, meaning you could literally feed an 'army' with delicious fish! "I often see anglers at Utah Lake with buckets full of white bass and stringers of large catfish and other species." Because white bass tend to travel in schools, action for white bass can be fast once you've located a school of fish. Using small-action lures or jigs tipped with bait are the best ways to catch white bass at the lake. Several other game fish also live in Utah Lake, including walleye, largemouth bass, perch, crappie, bluegill, black bullhead catfish and other species. The limits for the various species are different, so please see the limits in the 2011 Utah Fishing Guidebook before fishing at the lake. The free guidebook is available at www.wildlife.utah.gov/guidebooks. "Utah Lake is a fun place to throw a worm or a lure because you never know what you're going to catch," Root says. Root says Utah Lake State Park, the Lincoln Beach Boat Harbor, the American Fork Boat Harbor and the Lindon Boat Harbor are some of the most popular boat launching sites at the lake. And each location offers nice facilities. If you don't want to pay a fee to access the lake, some popular access points include The Knolls, the Provo Airport Dike Road, Lincoln Beach point and the Sandy Beach access area in Spanish Fork. For more information, call the DWR's Springville office at (801) 491-5678. Many anglers are familiar with Strawberry Reservoir southwest of Heber City. But few anglers know that early July is one of the best times of the year to fish Utah's most popular fishery. During much of June, fishing tends to be a little slower because cutthroat trout in the reservoir are spawning. The spawn is over by July, however. And the Bear Lake cutthroat trout are ravenous after the spawn. Root says casting minnow-imitating lures near weed beds and shoreline areas can produce large cutthroat trout that are seeking to fill their bellies with smaller fish. He knows two anglers -- Chris and Cam Starkey -- who use these techniques in early July and consistently catch and release 20 to 50 fish each fishing trip. 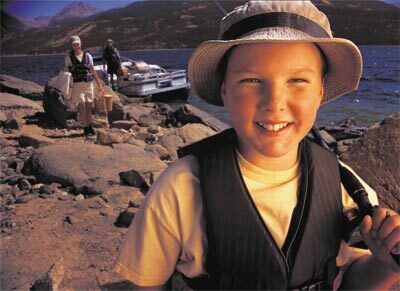 July is also a popular time to catch kokanee salmon that lurk in the deeper parts of the reservoir in mid summer. Some of the best ways to catch the tasty kokanee in July include trolling with downrigger equipment or simply jigging vertically for schools of the fish. If you're after kokanee at Strawberry, Root recommends fishing from a boat. Root says the DWR has stocked many rainbow trout into Strawberry during the past few years, and anglers are reporting good catch rates for the rainbows. "The rainbow trout are popular because they don't fall under a special slot (size) limit," Root says. "All cutthroat trout between 15 and 22 inches long, however, must be released immediately back into the reservoir." For more information about fishing at Strawberry Reservoir, visit www.wildlife.utah.gov/strawberry. Electric Lake might be one of the best spots to fish in southeastern Utah over the July 4 weekend. Located in the Manti-La Sal National Forest east of Fairview, Electric Lake is a scenic body of deep blue water couched among conifers and green mountain meadows. Conservation Outreach Manager Brent Stettler says elk and deer are a common sight at the lake. And the fishing at the lake isn't bad either! "Due to a very cool spring," Stettler says, "the ice didn't come off the lake until early June. Since then, fishing has been unusually good for trout up to 18 inches." Cutthroat trout are the most abundant trout in the lake. But anglers frequently catch tiger trout too. Both cutthroat and tiger trout eat other fish, so using meaty baits are the great way to catch them. Stettler says the best bait to use is a redside shiner, which is found in the lake. Other effective baits include dead minnows and chub meat. "If you don't have or want to use these baits," Stettler says, "nightcrawlers will also work. If you like to throw hardware, Stettler suggests using a Jakes Spin-a-Lure or a Kastmaster. "Silver and gold colors are the most popular colors and the best 'fish getters,'" he says. You can reach Electric Lake by traveling northeast on state Route 31 from Fairview or by traveling northwest from Huntington on Route 31. The only boat ramp is on the north end of the lake off state Route 264. Route 264 can be reached from Route 31 or from state Route 96 out of Scofield. If you'd rather spend your weekend at a smaller body of water, try Grassy Lake or Petes Hole above Joes Valley Reservoir. Other excellent choices in southeastern Utah include three waters in the mountains above Ferron -- Willow Lake, and Ferron and Duck Fork reservoirs. "The ice recently came off these waters," Stettler says, "and the fish are ravenous." It's taken awhile this year, but by the July 4 weekend, you'll finally be able to access some of the higher elevation waters in southern Utah. Navajo Lake might be one of the best waters in southern Utah to fish over the July 4 weekend. Access to this lake on Cedar Mountain east of Cedar City has been delayed this spring by a heavy snow pack. But there's also a big plus to the snow the area has received -- lots of water. Chamberlain says Navajo Lake is full, and conditions are great for rainbow trout the DWR stocked in the lake this spring. "Early surveys at the lake this spring also indicate some nice splake and brook trout made it through this past winter," he says. If you're fishing from the shore for rainbows at Navajo, Chamberlain suggests using powerbait, or a worm and a marshmallow. If you're fishing from a boat, trolling with a spinner, a spoon, or popgear and a worm will work for the rainbows. "For brook trout and splake," he says, "still fishing with a night crawler or a piece of chub or sucker meat will probably work better than the techniques you'd use to catch rainbows. "A jig tipped with bait will also work." For fly anglers, a wooly bugger or leech pattern -- in a darker color -- is a good place to start. "At times," he says, "some good insect hatches and surface activity happen in the western end of the lake." Camping is available at several U.S. Forest Service campgrounds. Cabins and boat rentals are also available at the Navajo Lake Lodge. Lakes in the Boulder Mountain area are another good place to try in early July. Although access may still be limited to the "Boulder Top" (lakes at the higher elevations), the lakes down from the rim of the mountain will be accessible. And Chamberlain says the lakes will provide excellent fishing as trout feed heavily after spending a long winter under the ice. "The lakes contain a mix of species," Chamberlain says, "but they're best known for their brook trout." For the brookies, a black marabou jig or a similar plastic jig has long been a standard among Boulder Mountain anglers. Chamberlain says the key is to fish the jig near the type of cover (logs, vegetation) that brook trout love. Leeches, buggers or scuds are good fly patterns to try. Several other varieties of trout, including cutthroat trout, various hybrids and rainbow trout, are also found on Boulder Mountain. Picking a spot that has a couple of different lakes -- and several species of trout -- will help increase the odds that something will bite your hook during your trip. Chamberlain says roads in the area can be an "adventure" to travel, and some areas have travel restrictions. "However, we manage with rainbow trout a few spots that are readily accessible by vehicle," he says. "These rainbows are a sure bet for anglers this time of the year." These waters include Lower Bowns Reservoir, Posey Lake and the Barker reservoirs. For more information about fishing in southern Utah over the July 4 weekend, call the DWR's Cedar City office at (435) 865-6100.